What do you get when you put an American, a Canadian and a Frenchman in a canoe (Besides the start of a really bad joke)? An incredible trip floating down a beautiful river with memories that will last a lifetime, and a green submarine. The start of the incredible scenery on the river. After our bodies hit their binge-drinking breaking point at the brewery, it was time to get away from things for a bit. Where better to go than out in the woods for 5 days on one of New Zealand’s 10 “Great Walks”. The “Great Walks” are the Department of Conservation’s (DOC) way to highlight some of the epic backcountry that New Zealand has to offer while also corralling tourists into manageable, safe and supervised areas to reduce personal injury and the impact on the environment. 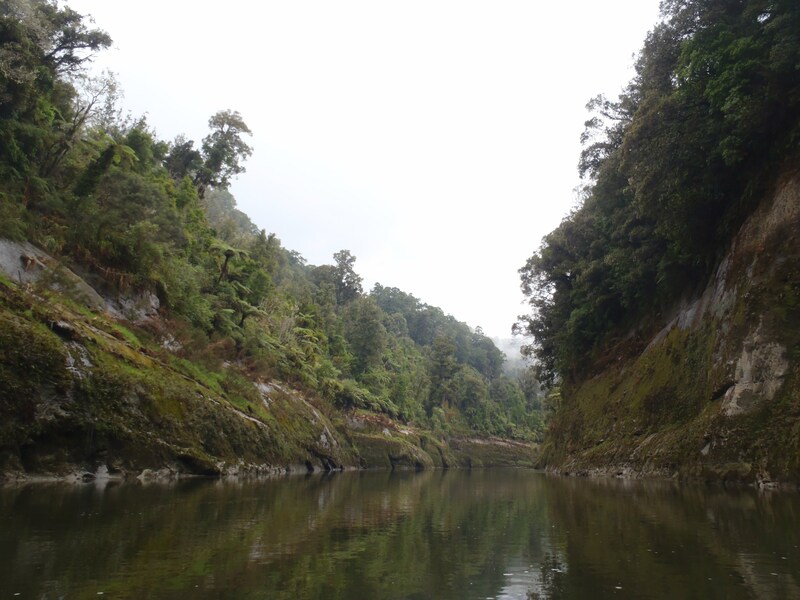 9 of the Great Walks are done by foot with one unique trip, a 5 day, 150km float down the Whanganui River which is located in the central part of the North Island. We knew this was going to be one of our more expensive tourist to-do’s while in New Zealand but rather than renting a canoe at $200/person we bought a $1550 Subaru Legacy which we named Mushu after Mulan’s Dragon (another story for another day) and rented a canoe from a local outfit near the brewery for just $125/person. Before embarking on our adventure we were able to goat-rope one of our fellow brewery wwoofers into making the trip; Emilie from France who brought all of her trekking gear with her to New Zealand. 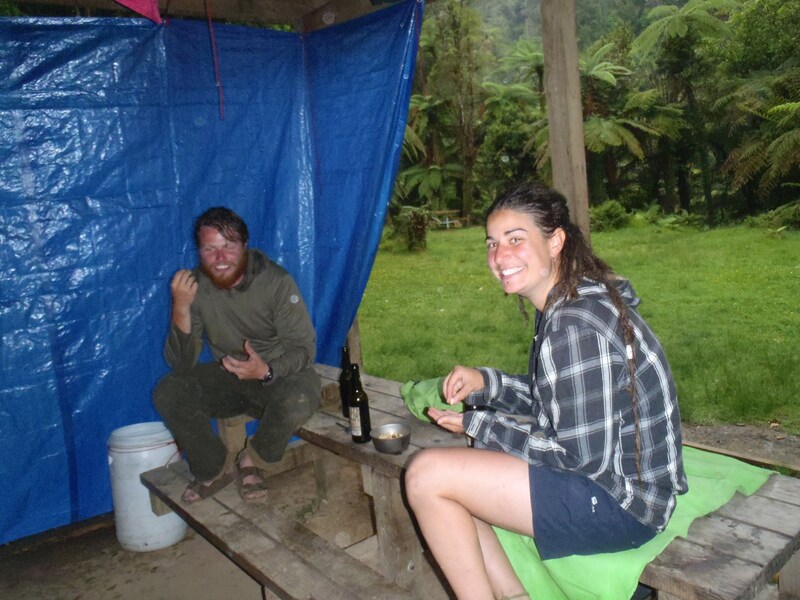 It is quite uncommon for “backpackers” to bring actual backpacking equipment with them here in New Zealand and Emilie had her camp stove, sleeping back and a tent and wanted to go on a river adventure! We drove to Tauramanui which is where we put in to start the river and left the car outside the Police station – hoping if anywhere in town was secure for our priceless ’96 station wagon it would be the police station! 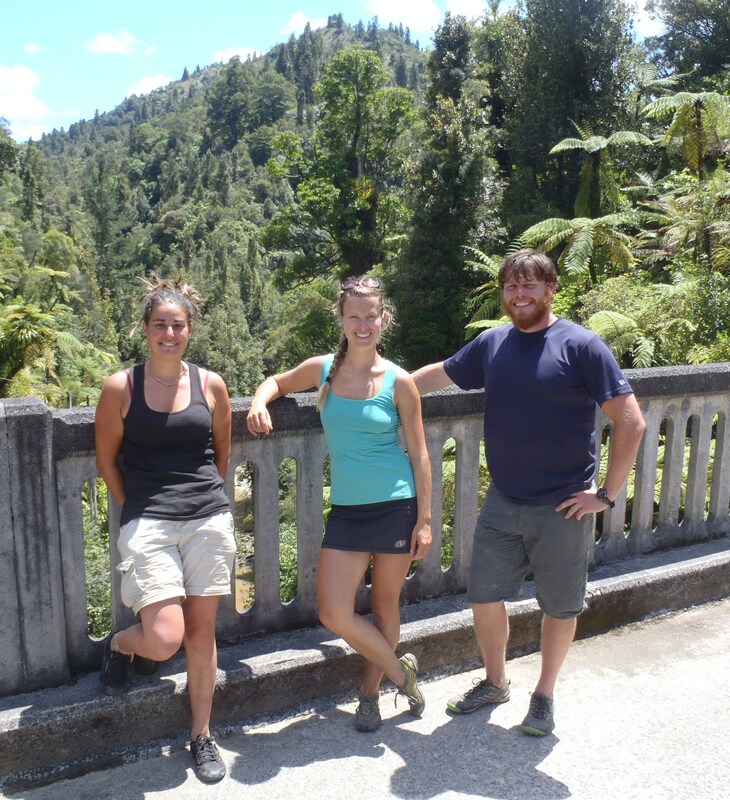 The three of us pose for a picture on the “bridge to nowhere”. The start of the trip seemed to be relatively eventful, encountering more rapids than we bargained for and after only an hour on the river, thunder could be heard over the mountain and we quickly tucked into some trees next to a sheep paddock to spend the night in the rain under our tarp. Day two we covered the most distance thanks to some fast flowing water, as the top half of the river is the steepest and most eventful too! In all of the chaos of going into rapids and trying to avoid trees the river took my Red Sox, which I’ve had for years and taken everywhere with me, off my hat with a tree branch and down to the deep, murky depths for eternity… or to wash up on a bank and have a goat eat next week. What is an epic river odyssey without trials and tribulations though, right?! 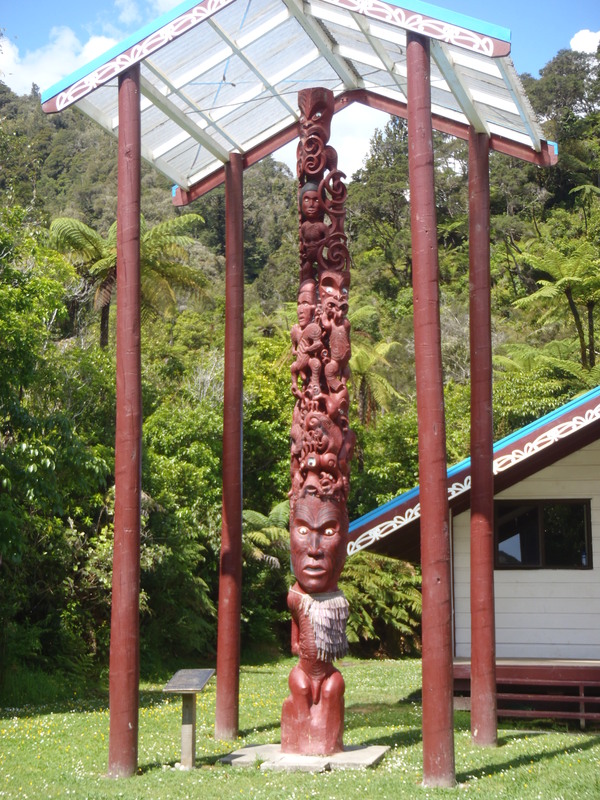 An intricately carved totem at the Mauri (native) village along the river. Days 3-5 encountered much more tourist traffic, as it is more common and much easier to put in 60km downstream and turn the trip into a 3 day with less rapids, more epic scenery and of course lower cost. 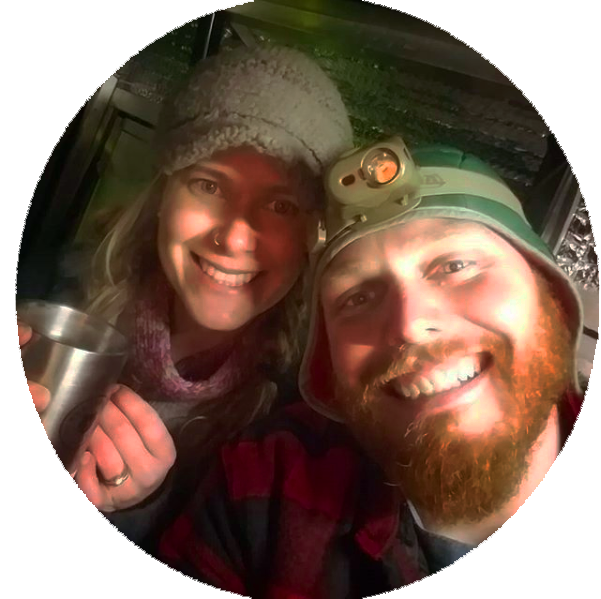 We tried to camp one stop ahead or one stop behind the major groups which let us do our own trip at our own pace and relax at night rather than worrying about sharing a cooking space with 25 other people. As the river slowed down the clay and limestone cliffs became tighter and tighter, eventually towering over us 150ft above. It truly felt like we were going back in time, floating in a canoe in what would’ve been prehistoric times when the dinosaurs ruled the land as we felt like tiny specs on Mother Nature’s canvas. The Jurassic, jungle feeling really sunk in at the end of Day 3 when the clouds opened up and poured down on us in a monsoon-like fashion. Thankfully. we were the only ones in the campground and could set up our sleeping area in the little cooking shelter (see photos). Emilie and Clay staying warm and dry during the monsoon. The trip finished with some less-than-epic rapids that we had been warned about from the start of the river – probably lessened due to the intense rain from the days before. After getting out of the river, taking a quick swim and putting on clean clothes I had the most difficult task of the whole 5 days; hitching back to the start point, two hours away. The town that marked the finish point of our trip was sleepy to say the least and it took two hours just to get a ride to the main highway. As evening approached and Lindsay and Emilie started to get worried if I would make it back or not, the blue Subaru roared around the corner into town to strap the canoe back on top, a job well done and an incredible journey complete! 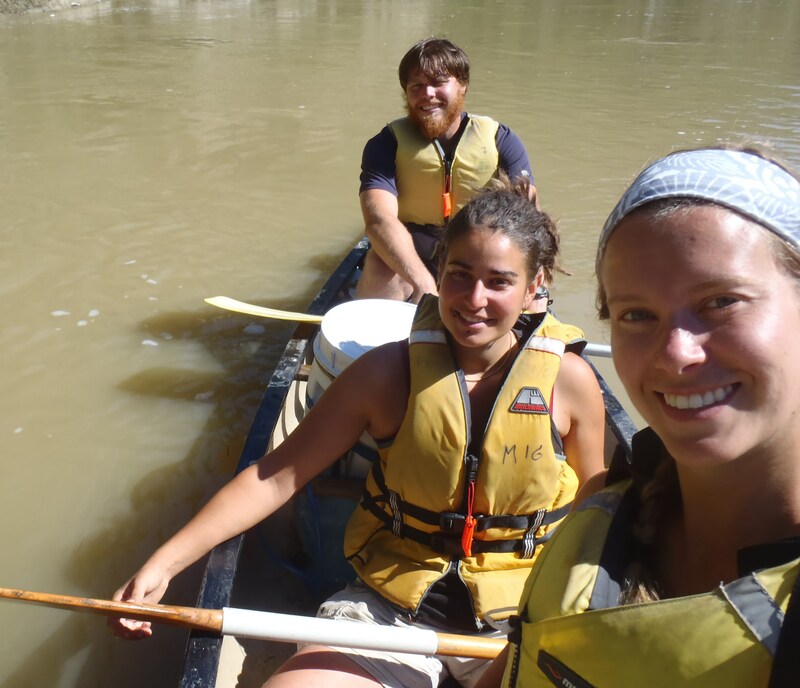 The three of us on our final day on the river! Oh and the “Green Submarine” you might ask? Allow me to set the scene; morning of day two so we still had plenty of food and beer (of course) weighing us down plus the gear for three people and the bodyweight of all three. Needless to say, our Old Town Canoe was riding pretty low in the water and on top of that we didn’t have our center of gravity low enough nor enough weight in the back of the canoe so that the person in the back could effectively turn in choppy water. So since we were camping 100m shy of probably the biggest rapid on the river what did we do? Put in right from our campsite rather than portage past the big water, naturally! We hit the first drop and started to list sideways in the water, allowing many liters worth to pour into the canoe. After that we were done, tippy because of the top-heavy loading and low in the water due to weight we became a lost cause with every wave, rock and spray dumping more water into our boat. No one panicked, no one jumped out, rather we held onto our paddle and the canoe in our other hands and simply sat in our, now submarine-d, green canoe. The canoe was fully under water with the bottom gently bouncing off the rocks at the bottom of the river while we continued on with the flow of the water and three people in a submerged canoe happily floating along in the whitewater. It all went wrong when Lindsay’s morning snack, a banana, started floating out of the canoe. She abandoned the rest of the team and her ship and bailed out after her treasured banana… after which chaos ensued. My shoes started falling off as I tried to hold onto the canoe, Lindsay was gone chasing a banana, Emilie floated away holding onto Lindsay’s paddle and down the river we went. Fortunately 100m after the white water ended a little beach stuck out from the river bank and there we went to collect ourselves and our boat… and sing the New Zealand rendition of the classic Beatles song. 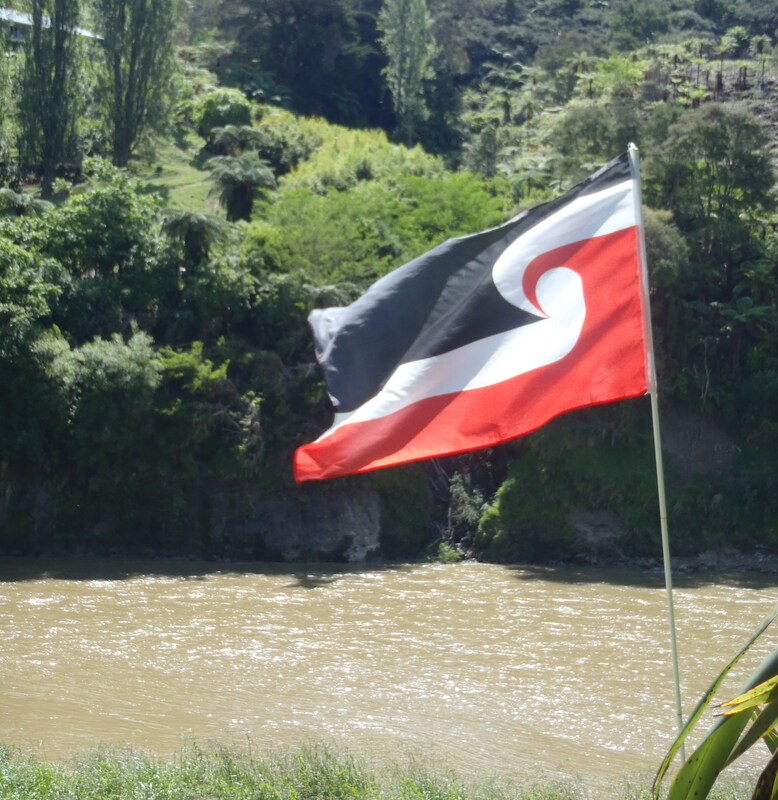 The Mauri Flag flying above the Whanganui River. ← Mike’s Organic Brewery – is this real life?